Leadership Development Courageous leadership is integral to institutional success. Credo Co-Founder Joanne Soliday states, “The most important element to the health of an institution in today’s urgent times is a strong and capable leadership team.” How does your institution develop leadership? Higher education leaders translate your institution’s vision into reality. Is your leadership up to the task? Credo understands that effective leaders are courageous and collaborative, integrating holistic innovation with best practice strategy, enabling further growth rather than capping the success of the institution. Every leadership position is an opportunity for growth, and at Credo, we have the breadth of services to empower every leader on your roster—from the President to the Board to the Cabinet. We can offer you strategies, recommendations, workshops, and leadership development to support your institution’s mission, vision, and strategic plan. 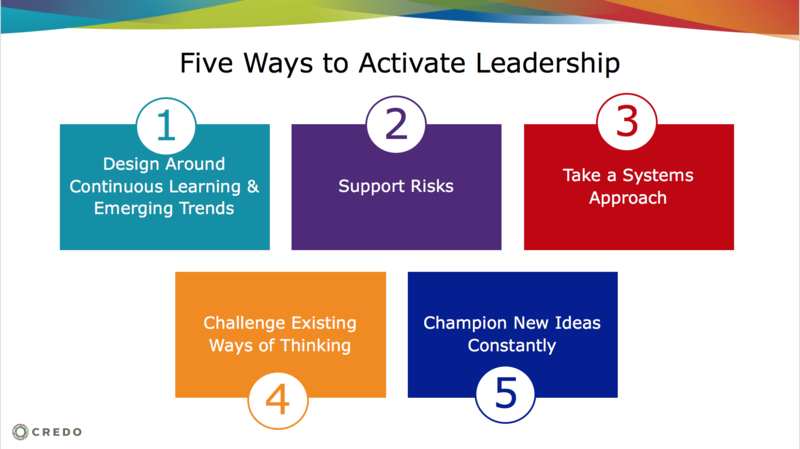 Get our Five Ways to Activate Leadership download here, and for the full story, check out the corresponding blog.